The DOFF N' DONNER (DND) is a very soft device that allows you to quickly and painlessly slide compression stockings over an arm or a leg. The DND is suitable both for use by stocking wearers themselves, as well as caregivers. 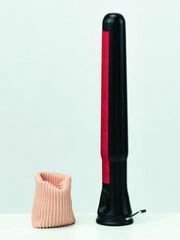 The Cone simplifies the rolling of a compression stocking onto the DND. With the aid of the Cone, the medical compression stocking can also be easily unrolled from the DND. The Cone has a suction cup built into the base so that it attaches well to flat surfaces. Facilitates the donning and removal of compression stockings and promotes treatment compliance. Less effort spent on donning and removal. Allows compression stockings to slide painlessly over wounds, scars and open legs. Suitable for use by the wearers themselves, as well as caregivers. Is extremely durable and suitable for different leg shapes. Extends the life of the compression stockings. Suitable for models A–D calf stockings and A–G thigh stockings with/without grip top in all sizes and compression classes as well as with open or closed toe.